Arran's spectacular peaks dominate the Clyde Estuary and are the backdrop to the island's main ferry route linking Brodick to mainland Ardrossan. As with most of Scotland's west coast ferry routes, this service is operated by Caledonian MacBrayne, often shortened to CalMac, a company name well known to tourists and dwellers of this region. For renewal of its operational safety certificate, each Caledonian MacBrayne ship undergoes an annual overhaul, during which it is replaced by a relief vessel. 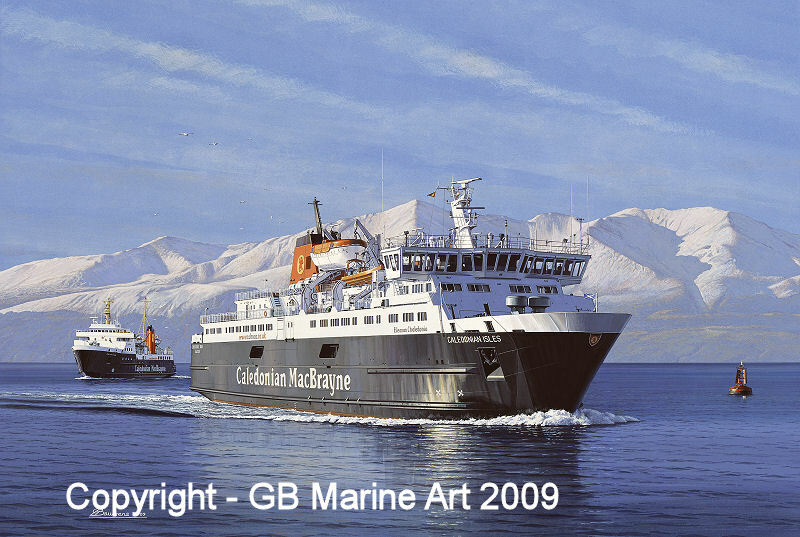 This highly detailed painting by Gordon Bauwens shows the now-gleaming Caledonian Isles returning from her annual refit and being met by relief vessel and predecessor, Isle of Arran, as the two approach Ardrossan Harbour. Described and commissioned by Captain Ian Walker, former Master of both these vessels on the Ardrossan-Brodick run, the picture features the two CalMac ferries set against the magnificent vista of Arran's wintry peaks. This highly exclusive Limited Edition of only 75 Giclee prints is produced on 300-gramme watercolour art paper using inks with a lightfast rating of 75+ years. Each superb quality Giclee print is individually signed and numbered by the artist and comes with matching Certificate of Authenticity. From an original gouache painting by Gordon Bauwens showing CalMac's Caledonian Isles and Isle of Arran meeting off Ardrossan. Limited Edition of only 75 Artist-signed GICLEE prints.